For the second consecutive year, Kooheji Jewellery organized a Wedding Week in its shop at the Panorama Mall in Riyadh, Kingdom of Saudi Arabia during 18-22 December 2017. 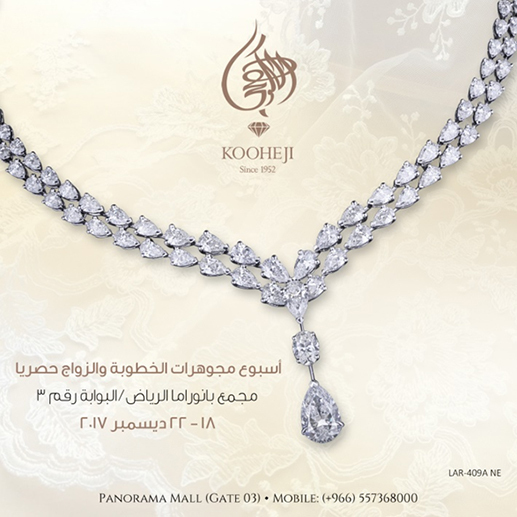 Kooheji Jewellery is keen to organize the Wedding Week annually in its shop in Riyadh, due to the high demand from the area’s customers for its exclusive and royal sets and engagement rings, which are known for its high-quality design and manufacturing. During the Wedding Week activities, wedding and engagement rings, exclusive wedding sets, special pieces from the “Kooheji Solitaire” collection, as well as special pieces from the new “Fajer” collection, which was recently launched to commemorate the 65th anniversary of Kooheji Jewellery. The exclusive showcased pieces and sets have earned the admiration and appreciation of customers and visitors, who have praised the distinctive styles of Kooheji Jewellery from a variety of design and craftsmanship, as well as the endless elegance displayed by these sets and pieces.